mule train, originally uploaded by jiulong. "Where in the world is to be found scenery comparable to that which awaits the explorer and photographer in northwestern Yunnan?" So wrote Joseph Rock in 1925 after he had returned from an epic trip to what he called "the great river trenches of Asia". 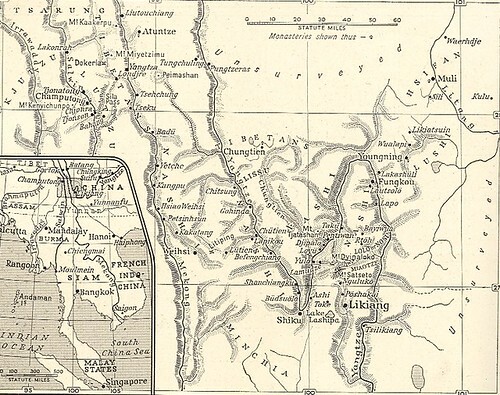 This refers to a unique area where three of Asia's major rivers run in parallel for a few hundred kilometres, creating huge canyons separated by high ridgelines of mountains. Here the rivers Yangtze, Mekong and Salween run briefly together from north to south, before separating to flow to widely different outlets. The Yangtze - known as Changjiang in China, makes an abrupt turn northward at Shigu, then after looping back south, turns eastward to flow through the heart of China to exit into the Pacifc Ocean near Shanghai. The three rivers mark a dramatic transition from the tropical Burmese jungle to the temperate uplands of Yunnan. The series of three canyons and five high ridges act as a barrier to the monsoon rains coming from the Indian subcontinent, and thus create a series of unique climate areas, starting with the moist leech-infested jungles to the west of the Salween, and eventually reaching the arid alpine uplands to the east of the Yangtze, in the rain shadow of these huge peaks. As well as having a wide variety of local climates, the region is also host to numerous different ethnic groups. 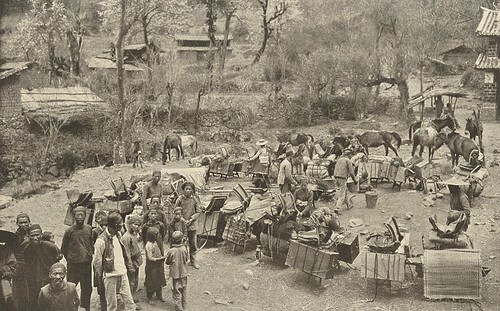 In the north are the Tibetans, to the east were the mountain tribes of Burma, and each of the valleys had its own mixture of minorities: the Lisu and Naxi in the Mekong valley, the Nu and the Drung in the Salween valley. Rock's description of them as river trenches is apt, for here are deep cuttings and gorges, separated by lofty peaks of up to 25,000 feet high. These river-mountain divides also form what became known as "The Hump" in world war two, the great barrier that was surmounted by transport planes trying to deliver supplies to China from India after the Burna road was captured by Japanese forces. In October 1924, Joseph Rock set out from his base near Lijiang on another one of his exploratory trips, with the aim of visiting all three of these rivers. As usual, he took a large retinue of Naxi servants, helpers and bodyguards, 15 men in all, plus numerous mules to carry his three month's worth of supplies.